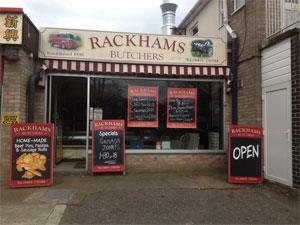 Rackham's Butcher's in the village of Ormesby St Margaret near Great Yarmouth, sells locally sourced beef pork lamb and chicken. We make our own sausages (5 different varieties), home made pork, beef and chicken burgers and cook our own ham and salt beef. All major credit cards accepted and we always have 5 lb bargain packs available.